As a signal of how far the money transfer space has developed, sport sponsorship is beginning to open up as a marketing opportunity. 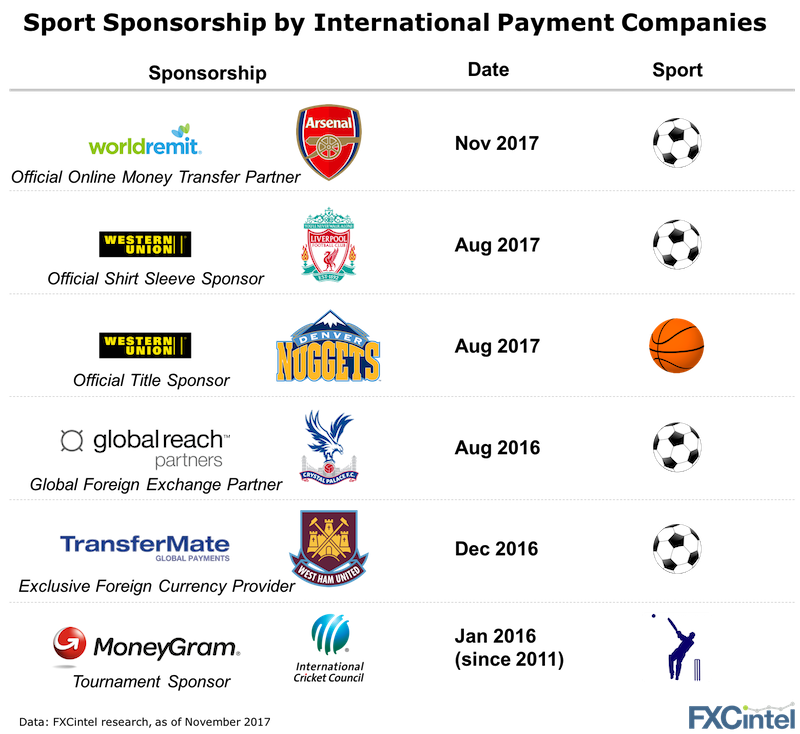 WorldRemit announced last week their partnership with Arsenal and this follows Western Union’s deal with Liverpool. Aside from local market/community sponsorships which we have excluded from this analysis, the last twelve months have seen a boom in sports and money transfer partnerships. See the end of this article for a list of other current and past sports sponsorship in the sector The real question is whether football is the correct sport to be focusing on? Since football offers halo brands, fans around the world and decent in-stadium crowds, it is no surprise to see it as the most popular choice. If you are really looking maximise your return and reach money transfer customers which are by definition a niche financial product audience, you could consider more specialist sports such as speed-skating, biathlon or badminton which are typically watched by expat audiences around the world. These sports bring very defined, targeted audiences at much lower costs. Or given the target customer of an FX broker, triathlon, the highest average income participation sport could be an interesting opportunity. Before you consider spending money on sports sponsorship ask yourself do you fully understand all the elements of the following equation: – Can you accurately assess the lifetime value of your customers? – Have you allocated the right amount of budget to activating your sponsorship? (ie its not just the spend on the boards around the pitch or a logo on a shirt as otherwise, this equation quickly goes to zero) – How should you compare this marketing spend to online advertising, TV or outdoor media? Do you have the measurement tools to assess this across the globe? Answering these questions is what we love doing. We may love sport (and have colleagues with a lot of experience in sports sponsorship) but we love even more happy clients with high ROIs. We spoke this week with WorldRemit CMO Alex O’Shaughnessy about the deal. On why now was the right time to add sponsorship to WorldRemit’s marketing mix: “Having focused on growing the network, we now have a truly global network and this is the right point for us as a business to scale-up our operations by investing in growing our global audience.” On what activation WorldRemit will be doing to support the sponsorship: “We will use the partnership to reward WorldRemit’s customers and Arsenal supporters through exclusive events and experiences where we can also leverage the power of football to inspire people. We will launch the partnership with the first in a number of competitions to win travel to London and tickets to watch the team play at Emirates Stadium.” Apart from a love for Arsenal and their aligned brand values (hard to write as a supporter of their arch-rivals Tottenham! ), this is very much a learning experience for WorldRemit. WorldRemit picked football simply because of the global reach it can offer but don’t rule out further sponsorship down the line. Whether WorldRemit’s (or any other player’s) next sponsorship should be of another team, a player or a federation and football or another sport remains an open question.